Updated drivers and tried everything out. Here is SE log, shows same as before, total and available video memory = 964, and then below this total RAM 4095 and available RAM 3974. I guess my question is, does SE make use of shared memory? And if so could increasing that or adjusting config file settings prevent further crashing when loading planet textures? SE does make some use of shared memory with Nvidia cards, but almost all users of AMD/ATI cards have reported that it does not. Keep Fast texture loading turned off, it is an experimental feature with bugs. HarbringerDawn how long does it take your cpu to finish loading planet textures with LOD set to +2? It takes a while. I usually don't use it since it will be too much for any system to reliably handle with regular use (unless by some stroke of luck). But if I'm on the surface of a planet and I change to +2, it may take around 45-60 sec to fully generate the landscape in view. I have an ATI card so, what I'll do is this: set autodetect to off, set available memory to what the SE config file detects as total memory (not just VRAM), disable fast texture loading, and try to snap some nice shots. I'll post back if it crashes as before. I did try it once to see if it would load textures faster, and it probably does, at the cost of making close up textures low res, so I turned it back off since having good textures all around is worth waiting for it to load. So far I'm finding much better performance using autodetect off and manually setting VRAM higher. I haven't set it to the total VRAM I have, which is 4095, only to 2048, twice my dedicated card value. I think my crashes might have been from fast texture loading. I will start upping VRAM value incrementally to 4095 and see if anything happens. ATI card owners - rejoice! I got a crash message while flitting about intergalactic space. It said that there was a runtime error and that it did a request to close the program in an unusual way (I didn't copy and paste the error, though there wasn't any specific error number) I've attached the SE log. My guess is that it was trying to load lots of galaxies too fast or I was moving too fast in intergalactic space, dunno. Also, some time earlier, when I was out at the edge of chaos, I got some kind of C++ error and crash, which was definetly due to loading countless galaxies. Edit: Happened again, although I had procedural galaxies off and I was messing with the magnitude. Maybe a cache problem (and yeah its a C++ runtime error). smjjames, judging by your logs these things happened after you had been flying around for a while. If you fly around in SpaceEngine long enough, a crash is almost inevitable. I get these myself. There is no way to avoid them. This may be especially true in your case due to having very modest hardware. In the future the program will continue to be improved and one day crashes will be completely eliminated (they are already very much reduced compared to previous versions). Just an fyi - no further crashes using an ATI card and manually setting MaxVideoMemory. Used SE for around 2 hours, going all over the place, planets, galaxies, etc - no crashes! very nice. I also had this problem where spaceships would start spinning uncontrollably, but thats stopped now as well. Might be for unrelated reasons. I did that in an attempt to fix the procedural planets not loading problem (it helps some, but the problem doesn't go away). Not sure if I should be reporting crashes here or on the other thread. I've been getting this error a bunch of times this morning. Once when leaving the surface of a moon and then a bunch of times when I had landed on the dark side of a tidally locked planet and I was messing with the exposure settings so I could see the landscape at night. Going to do a restart and then attempt to do a couple of the suggestions listed on the first page. I've attached the SE log as well. Normally, I have no problems with the night side (ie, when its nighttime on a non-tidally locked object). Edit: I was able to do it when I had LOD on -2, nebulae off, catalog planets off, catalog stars off (or all of them? ), and procedural clusters off. However, the instant I raised the ambience, the error happened again. Edit2: Here's the code for the planet I was having problems with. Edit: I started having the problem again with another planet and it was at night too. However, despite it initially looking like I saw stuck because the savepoint was on that planet at night, I was able to get around it by turning off all the show objects and disabling all the graphical effects, going into SE and setting the time to when it wasn't night. So, theres some kind of problem with loading things during night? I'd have to test it outside the suns nehborhood (probably another galaxy) to eliminate any kind of problems that the denser number of stars (catalog+procedural) could be causing. Edit: I went and tested on some tidally locked planet in Andromeda and it worked fine. So, maybe something with the catalog stars is causing issues? I recently bought a notebook and downloaded Space Engine + Patch. Everything works fine but i dont know why my PC is unable to generate planet landscapes when i try to get close to surface. There is no msg error, however when im close to the ground the only thing i can see is a flat texture (LOD -2; -1). If switch the LOD to 0, 1 or 2, it tries to generate something, but it only show some kind of artifact disorted textures and shapes. Anyone know what i can do to run the program properly? 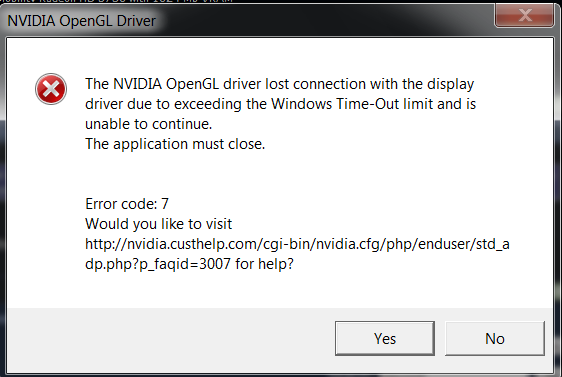 How exactly do you force programs to Nvidia? Through the Nvidia control panel. By default you should be able to access it by right clicking on your desktop. Otherwise just go into the Control Panel to find it.